Assuming that you have already prepared the block and pistons. 1. Attach a small “lifting eye” to the centre stud on top of the block. 2. Mark the front edge of each bearing cap with its number and remove the cap making sure that the big end bolts are fully seated. 4. Apply gasket cement, eg. Wellseal, to the outer edges of the block (photo 2) as shown in the diagram (photo 3). 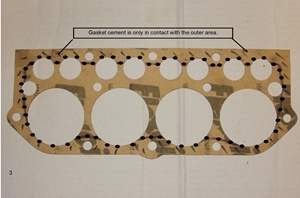 Position the gasket on the bottom of the block so that it is held in place by the cement (photo 4). This can be fiddly if you have the oil cups fitted to the con rods. .
Now the clever bit….! It is useful to have a small string pulley hoist hanging from a beam above the workbench. 5. Attach the hook on the hoist to the lifting eye and raise the block up. It should now be dangling from the hoist with the con rods hanging out the bottom! (photo 5). 6. Mount the crankcase on an engine stand so that the top deck is roughly horizontal. 7. 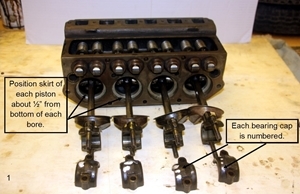 Rotate the crankshaft so that the journals on 1 & 4 are at the top. Lock the crank in this position (also photo 5). A tapered wedge between the flywheel and crankcase should be sufficient. 8. Raise the block so that you can position the crankcase directly beneath it. 9. 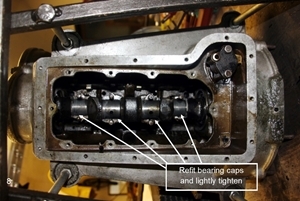 Carefully lower the block so that the big ends are slightly below the top of the crankcase. 10. Position the oil cups into their recesses on top of the crankcase. 11. 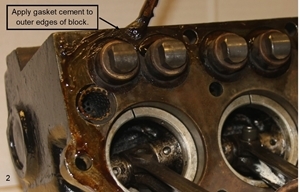 .Apply gasket cement around the outer edges of the crankcase. Mirror what you did on the base of the block. 12. 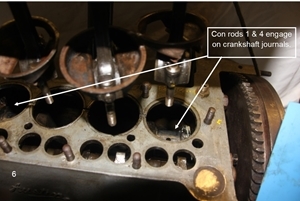 Slowly lower the block so that the big ends on con rods 1 & 4 engage on the crankshaft journals (photo 6). 13. 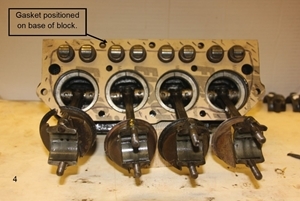 Continue lowering the block until the big ends engage on 2 & 3 by which time the block should the on the crankcase. Gently rocking the block from end to end as you lower will help the pistons slide up the bores. Guide the big ends onto the journals with a hand up from underneath the crankcase. 14. 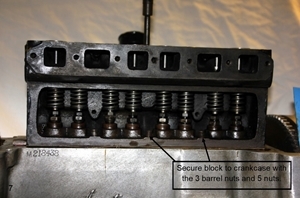 Secure the block to the crankcase, 3 barrel nuts and 5 nuts. Tighten down firmly but don’t over tighten (photo 7). 15. Remove the block from the hoist. 16. Turn the engine on its side and refit the bearing caps, after apply some oil to the bearing surface, making sure the markings are facing the front. Lightly tighten the nuts (photo 8). 17. 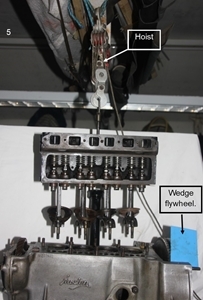 Remove the wedge securing the crankshaft in position. 18. Fully tighten each pair of big end nuts in turn but rotate the crank one revolution to check it rotates freely before you tighten the next one. 19. Leave the engine to stand for 24 hours. Very important! 20. Finally fully tighten the block to crankcase nuts. Reading this description makes it look very complicated but it has taken far longer to write than it takes to do the job! 10-15 minutes should see the job completed bar the final tightening. This article, written by Andrew Jarmin, originally appeared in CA7C Seven Focus Dec 2018 pp18-21.